The United States has recovered more than 19 million from AMEC in damages and penalties to settle litigation regarding fraud, false claims and kickbacks on Federal contracts in Sacramento, San Francisco, St. Louis and New Jersey. At the World Trade Center, AMEC destroyed very important evidence during the clean-up. This and the tampering witnessed by many residents in our neighborhood render AMEC’s soils test results false and unacceptable and Un-American. Why are we entrusting the health and the lives of Gainesville’s children to AMEC? The “Raw Deal” as acknowledged by this Commission earlier this year really gives us a toxic waste dump. Dumping additional toxic residential soil on top of the already contaminated superfund site allows creosote, and other Koppers chemicals to continue to contaminate our drinking water, the Floridan Aquifer. Removing one foot of polluted soil and entombing residents in toxic homes does nothing to protect families. Officials already know that in some homes two to four feet and even twenty to forty feet of toxic soil have already been replaced with clean soil, only to find out later that the replacement soil is just as contaminated as the original soil. According to Beazer East employee Mitch Brourman, this clean-up is “the best clean-up ever in the nation”. No, EPA and Beazer East, this is NOT “the best clean-up ever” and it is NOT protective of Gainesville residents and our city. This is nothing more than a criminal cover-up that is Keeping Gainesville Toxic. We need and want out of our toxic homes! Residents want to thank Todd Chase: he is the only City Commissioner that fully understood the implications of accepting this cover-up/raw deal. We are grateful to him for voting against it. This Raw Deal will forever stamp Gainesville with the stigma of Toxic City. AMEC engineers and scientists hired to do environmental assessment for the Raven Coal Corporation in Port Alberni Canada falsified data about the Alberni Airshed, not once but twice. When AMEC published their final assessment of air pollutant concentrations in the Alberni Airshed, they claimed that DIOXIN levels in the airshed were well below the safe level standard for air quality set by the Canadian Government and the World Health Organization. But AMEC was not aware that the Canadian Government monitors the Alberni Airshed for air pollutant concentrations. The Canadian Government’s reports confirmed major DIOXIN air pollution in Port Alberni, contrary to AMEC’s air quality report. Investigation into AMEC’s actions in Port Alberni proved that AMEC never collected any air quality data in the Alberni Airshed- their report was composed of false test results invented to meet the needs of their client. AMEC’s fraudulent report included a map illustrating the locations of monitoring towers they claimed to have used for several years to collect their Alberni Airshed data. Upon investigation it was established that these monitoring stations never existed. It is said that one can tell a lot about a person’s character by the company they keep. AMEC is criminally fraudulent. Why does Beazer East keep using them in Gainesville? And why has Beazer East repeatedly lied to residents about rehiring AMEC under another name? Why is EPA allowing use of AMEC-derived data when the lives of Gainesville’s children are at risk? This farce is costing lives in Gainesville! We reject AMEC’s sham test results and all aspects of the Beazer East/EPA coverup! 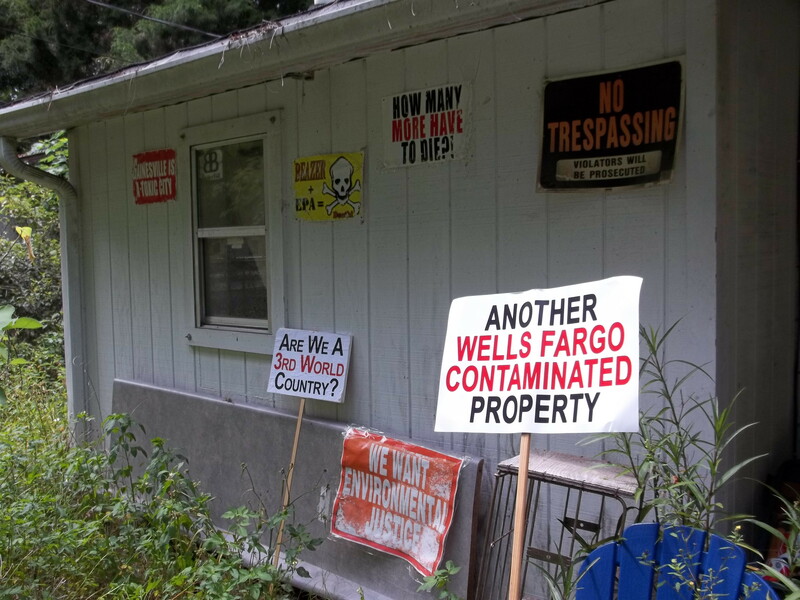 Our families want out of our dioxin-contaminated homes while we’re still alive! 1. In 2008 Great Britain’s Serious Fraud Office fined AMEC five million pounds for falsifying records and other related ethics violations. 2. In South Africa, AMEC was named in a bribery/kickback scandal involving contracts on the Lesotho Dam Project. 3. AMEC carried out the Environmental Impact Assessment for the proposed Chalillo Dam in Belize, and has been accused of burying the scientific analysis of the dam’s impact on wildlife that concluded the project would cause significant and irreversible loss of biological diversity. Geologists characterize AMEC’s Environmental Impact Assessment as “gravely flawed and so filled with errors so as to render it useless as a document for engineers to use in the design and the construction of the proposed dam.” They go on to state “The mistakes made by AMEC in the geological mapping of the Chalillo site would get a failing mark in an introductory geology class”. 4. Likewise, University of Florida scientists found AMEC’s assumptions and models regarding health risks associated with Koppers Superfund Site to be so flawed that they recommended to Florida DEP that AMEC’s data should not be used at all. Given AMEC’s worldwide reputation for unethical conduct and unreliable work, continuing to use their falsified data to drive our remedial action is a major mistake that will forever impact the reputation of our city. 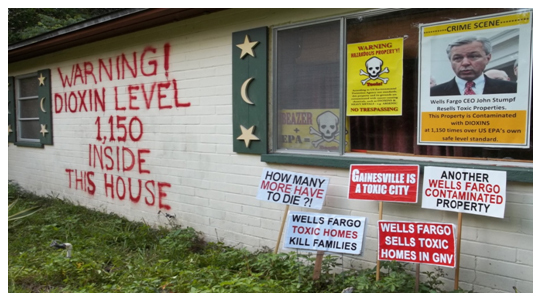 More importantly, Gainesville families will continue to sicken and die in toxic homes. We want out of this toxic city. We don’t want to die in beautiful but toxic homes- We reject this RAW DEAL! We still do not grant access to our property, parcel 08409-000-000, to Beazer East, Inc./Koppers Inc., Tetra Tech, MACTEC (AMEC), Kestrel Ecological Services, or any other entities or individuals working on behalf of Beazer East, Inc., US EPA, FL DOH or FL DEP for soil sampling or any other activity related to the dangerous and disingenuous “off-site soil remedial action”. Let us again plainly state that we are not participating in any phase of EPA’s and Beazer East’s “off-site soil remediation”. As you well know, in our neighborhood it has been repeatedly illustrated that clean replacement soils quickly become as contaminated as the replaced soils, sometimes even more contaminated. Further, your “remediation” fails to address the greater, more immediate danger posed to our families by the dioxin-saturated interiors of our homes. We refuse to participate in your purely cosmetic psychological exercise designed to deceive residents into the false belief that our homes and gardens will no longer be a serious toxic threat to our families. This includes any and all phases of the soil scraping and cover-up that you are trying to force on innocent residents in lieu of providing the real protective action that our suffering community needs and deserves. Please inform your contractors: NO employee of Tetra Tech, MACTEC (AMEC), Kestrel Ecological Services, Beazer East, Inc./Koppers Inc., US EPA, FL DOH or FL DEP may trespass our property at any time without both our explicit permission and our actual physical presence while you are there. This prohibition also applies to any employees of Alachua County or the City of Gainesville intending to trespass our property for any activities connected to the “off-site soil remediation” in Stephen Foster Neighborhood. I believe my client has made it abundantly clear by her unequivocal instructions and notice set forth in her message, that she does not wish to participate in any additional soil or dust sampling conducted by you or any of your agents or contractors. In the future, should you require any information pertaining to the Kennedy’s property, kindly contact me in advance of any attempt to secure the Kennedy’s permission or authorization to enter upon their property for any purpose. Please reply to our email so that we know that you understand its contents. Resident Farinda O’Steen Rejects USEPA/Beazer East Coverup: Shame on you EPA! As I told you in person when you came to my door earlier this month, you do not have my permission to enter my property; neither does Beazer East, Inc./Koppers Inc., Tetra Tech, Mactec (AMEC), Kestrel Ecological Services, or anyone working for Beazer East, Inc./Koppers, Inc., US EPA, FL DOH or FL DEP for soil sampling or any activity that’s part of the shameful “off-site soil remedial action”. As you already very well know, on my property I have already replaced up to four feet of toxic soil with clean soil several times trying to protect my family- and my soil continues to test extremely high in dioxin, arsenic, PAHs and other Koppers chemicals. My house is still making me and my family sick, and your six inches to one foot of clean soil won’t do me or anybody else any good. Stay off of my property. I am not taking part in EPA’s and Beazer East’s so-called “off-site soil remediation”. Mr. Roy Geiersbach and other neighbors have had twenty to forty feet of toxic soil replaced with clean soils and two years later, the new soil tested was every bit as contaminated as the old soils, even worse. EPA and Beazer East know this, and know that your soil cover-up won’t help any of us residents. Koppers contamination has taken my surviving family members’ health and peace of mind away forever. We have suffered too much for too long to suffer this outrageous sham too, and will not take part in any of the soil scraping and cover-up that you are trying to force on us innocent residents when you should be giving us permanent relocation out of homes that are killing us. Your “remediation” doesn’t do a thing to move our families out of our dangerous homes. Shame on you, EPA! Tell your contractors: NO employee of Beazer East, Inc./Koppers Inc., Mactec (AMEC), Tetra Tech, Kestrel Ecological Services, US EPA, FL DOH or FL DEP may trespass on my property at any time. This also applies to any employees of Alachua County or the City of Gainesville trespassing my property at any time for any activities connected to the “off-site soil remediation” in Stephen Foster Neighborhood. My surviving family members and I don’t want to be entombed here- we want out of this toxic neighborhood!